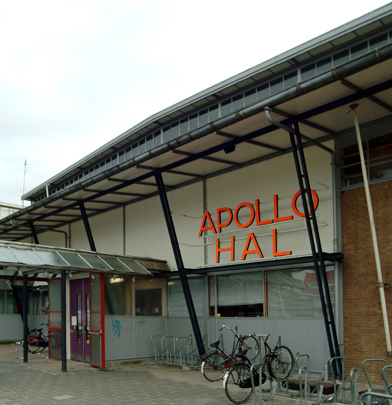 The 'Apollo' comprises a bar-restaurant, a manager's residence and a hall of five tennis courts that can also be used for exhibitions. The hall (35 x 85 x 12 m.) is spanned by six portal trusses; the roof is of hollow terracotta panels and the steel frame is brick-clad throughout. With such decorative touches as curved and angled slopes of roof, awnings and circular windows this building is a fine example of Groep '32 architecture.